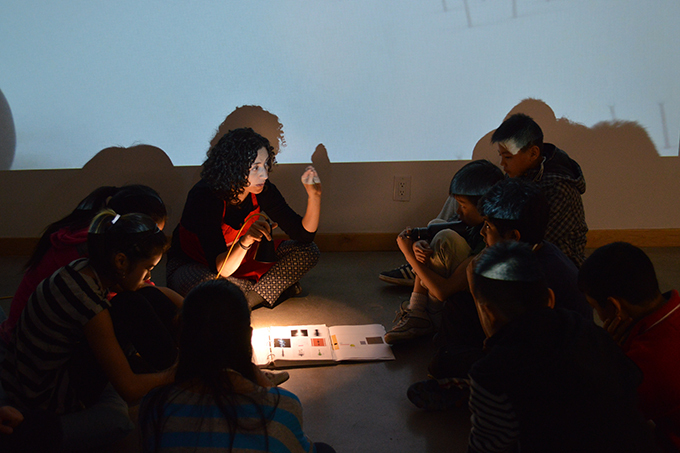 Last Thursday, students from General Currie Elementary and Grauer Elementary came back to the ArtStarts space for the second time this year. Their first visit in February was all about our previous exhibition Sound Play. Now that we are in the process of installing our new exhibition, Timescapes, we thought it would be a great opportunity to examine the curatorial process with them. Split into 3 groups, they explored the 3 main components of a gallery: the curatorial process, the exhibition space and the art content. First they spent some time with our Gallery Curator, Juliana Bedoya, and Gallery Coordinator, Francois Grenier. Here they entered a conversation about the curatorial process; starting with the art selection process and eventually insights into how an exhibition is mounted and displayed. With their heads filled with ideas of art, the next workshop involved making some art! Working with Gallery Assistant, Nargis Dhirani, this workshop is a practice in looking. 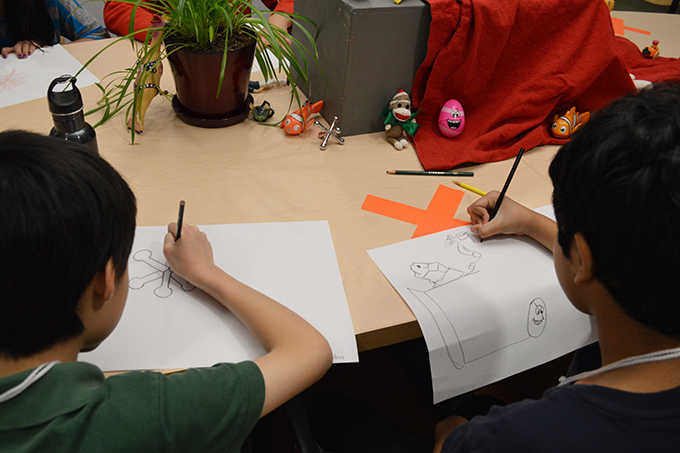 Sitting on rolling chairs around a table with a still life vignette, the challenge is to draw the objects in front of them using two drawing techniques: continuous line drawing and pointillism. But it's not that easy! Everyone is asked to draw for 30 seconds, then 1 minute, then 3 minutes, then 5 minutes, switching to a different station by rolling clockwise on their chairs, meanwhile the paper size increased as the length of time got longer and longer. After making art, each group then had the opportunity to work with Gallery Assistant, Lynsey Jack. Lynsey opened the conversation to focus on re-imagining the exhibition space. 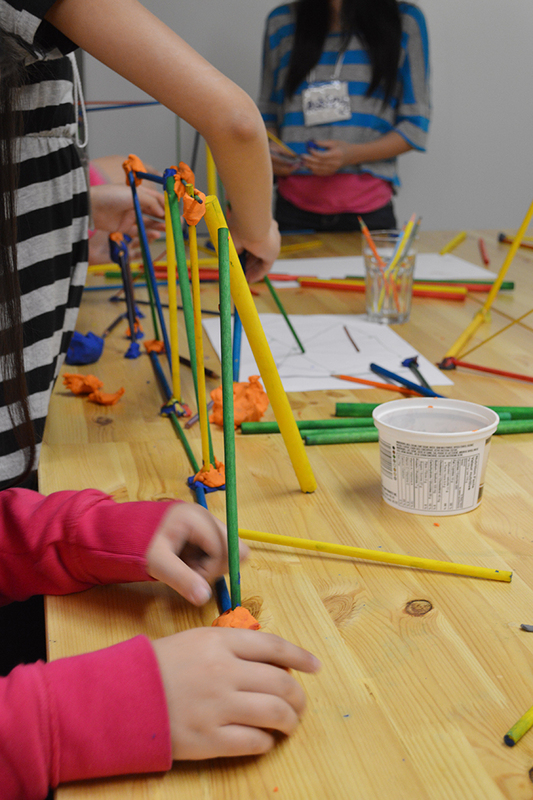 Inspired by museum exhibition spaces from around the world like the Louvre, the Guggenheim and the Royal Ontario Museum, each group explored function and materiality by using plasticine and dowels. Each group had to imagine how these spaces would function and what they would be made of. Finally, when all three components were combined together, each group was given space to install a mini exhibit that revolved around an existing art piece that will be featured in the upcoming Timescapes exhibition. Our next and final visit from the General Currie and Grauer Elementary students will be in May, just in time for the new exhibition.